Alan Campbell began rowing at the Coleraine Academical Institution before going on to join the Tideway Scullers School in London. After winning the Diamond Sculls at Henley Royal Regatta, Alan made his international debut at the World U23 Championships in 2003. 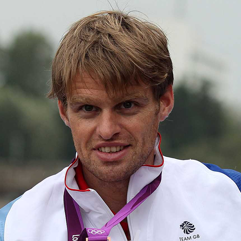 He went on to compete in the quadruple sculls at the 2004 Summer Olympics where he finished in 12th place. In 2008, Alan finished fifth in the Beijing Olympics and won a bronze medal at the 2012 London Olympics.